"I was out with a friend watching a band and this guy had a beat up amp, old Strat, a couple of pedals he had to kick to get working right, and if God played guitar, he sounded like this ...Truly incredible. I knew my approach was all wrong so I stripped everything out and went back to basics"
Having become a confirmed pedal addict, Daniel wanted to overcome the loss of top end definition caused by chaining multiple pedals, as well as the awkwardness of having to stamp on multiple switches (or the ‘tap dance solution’ as he calls it). 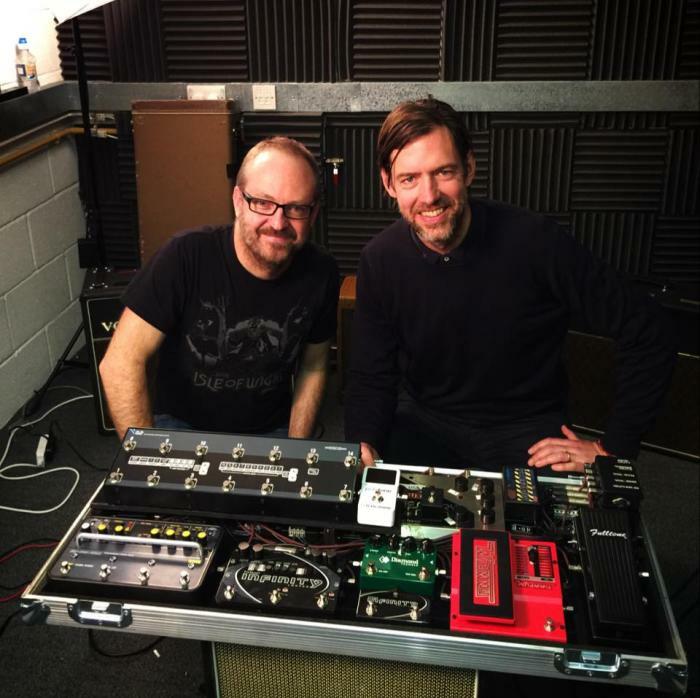 In 2003 he founded The Gig Rig with engineer Dave Mapleston and launched the Pro 14. The team can now count some of the world’s finest guitarists and songwriters among their customers (think Jeff Beck, The Pixies’ Joey Santiago, Radiohead’s Ed O’Brien to name but a few). We caught up with Daniel to ask him a few questions about his own musical and technological journey. Can you tell us how you got started as a musician? As long as I can remember I've loved the sound of the guitar. My mum was learning when she was pregnant with me, and only stopped when her bump was too big the reach the strings. Christmas when I was four my brother opens up this big triangle present, inside was a 1/2 size acoustic. He strummed the strings and something about that sound resonated with me. I still remember it vividly. I had such a strong emotional reaction. Mum bought me a guitar the next day and I've been playing ever since. There's a common saying that someone is a musician first and a guitarist second, for me I was definitely a guitarist first. I connect so strongly with the sound of the instrument. Who would you cite as your own most powerful musical influences? My first influence was my big brother. The sound of his SG into his old Marshall 50 watt combo is something that will stay with me forever. I went through the obligatory shred phase, Steve Vai's 'Flexable', and his work on David Lee Roth's 'Eat Em And Smile' had a big effect on me. I still think the later includes one of the top 5 electric guitar sounds ever recorded. I consumed this genre of guitar-centric music but it wasn't long before I realised with the odd exception most of it was leaving me pretty cold. Then I heard Crowded House. A pivotal point for me. From this moment on everything was about the sound. I adore Neil Finn's guitar playing. My next major revelation was hearing XTC and being exposed to Dave Gregory's guitar playing. His effect on me was profound. Here was someone who is a virtuoso, a master of the instrument, yet completely subservient to the music. That's what I wanted to be able to do, so I veraciously learned everything of his I could get my ears around. Fast forward 25 years and I now play in a band with him. Life is funny like that. I studied jazz and got into Wes Montgomery, Tal Farlow, Lenny Breu, Ted Green, not that I could ever play anything like these guys, but I loved the way that they channeled music, it just flowed through them. Inspiring stuff. One of my recent influences is Paul Stacey. He introduced me to the concept of fearless guitar playing. If there's ever an opportunity to see him play I will always be there. Inspiring stuff. Recently I've been working with Andy Timmons who I rate as one of the best out there. His sound, his melodic sensibility, his feel and attitude when he plays, it's just joyous. Can you tell us a little more about what inspired you to develop the Pro 14 and G2? I think because the sound of the instrument has such a profound effect on me I've always pushed as hard as I could to get the most out of it. As I grew up in the 80's I was terribly excited about the new technology making its way into the rigs of guitar players. To me at that time I thought 'state of the art' meant it simply must sound better. So I believed the strap lines and embraced technology. I spent thousands upon thousands looking for that elusive sound. My tone was a sonic disaster. Then I was out with a friend watching a band and this guy had a beat up amp, old Strat, a couple of pedals he had to kick to get working right, and if God played guitar, he sounded like this. Truly incredible. I knew my approach was all wrong so I stripped everything out and went back to basics. My simple rig sounded so much better, I was more connected with my instrument, my tone had become a vehicle to express. I started working with a producer and at one session he bought a crate of old effects pedals in to experiment with some sounds. I was in shock. These old analog boxes from the 70's sounded so much better than anything I'd ever heard. I stupidly assumed that newer devices manufactured with the advances of technology simply must advance the sound of these effects, but the sound I was able to conjure plugging in the archaic devices was inspiring beyond anything I'd personally experienced before. So I walked into a Guitar Crazy at Cogee beach in Sydney with $1000 to grab as many old effects pedals as I could find. I was a bit shocked that the $1000 didn't go very far as these things had started to become collectable as well. I thought of them as individual tone modules, combinations of which would give me different sounds, but there was a couple of problems. On my old Roland GP-8 I could program a combination of effects and recall it with a single press of a footswitch. It was very handy and although it didn't have the tonal purity of my pedals its was a convenience I was struggling to live without. 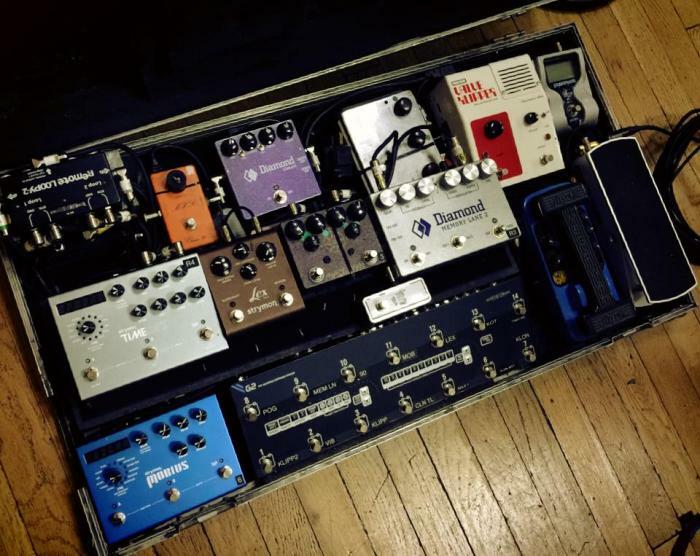 The other issue was the more pedals I wanted as options on my board, the more it had an impact on the tone and I was basically back to where I started. I new there had to be a better way. I needed a system that I could plug my effects into that I could program the combinations and take the unused effects out of the signal path when I wasn't using them. I searched and searched but there was nothing. 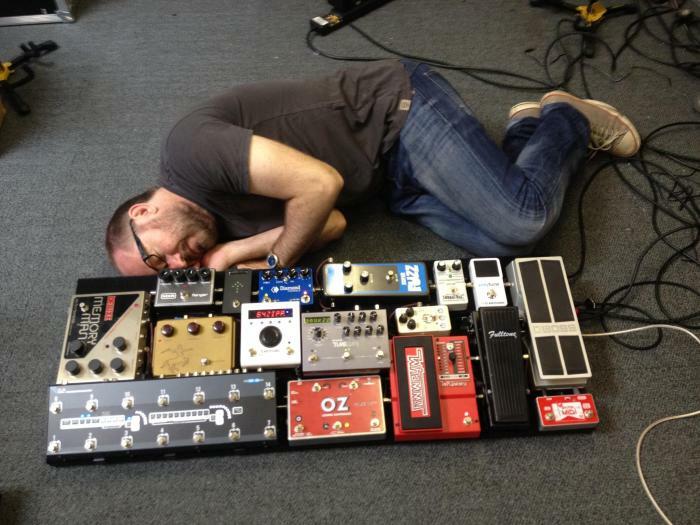 It was either pedals or multi effects. I was lamenting this fact to the producer I was working with when he casually remarked, 'well why don't you build it yourself?' The seed was planted at that moment. I started studying electronic circuits and building basic pedals, fuzz face clones etc to be able to put together this product. I had such a clear vision of what the Pro14 needed to be able to do so I worked towards it, but I soon hit my electronics skill plateau and realised I needed help. I asked about 20 electronic engineers who weren't interested until someone suggested I try their mate Dave Mapleston. He was a great engineer who also played guitar, so he got the concept right away. That was in 2002 and we haven't looked back since. Can you tell us about the most elaborate set-up you’ve been asked to put together for a client? Well I've done some great rigs but everything will pale in comparison to the rig I'm putting together for Devin Townsend. This thing is going to be remarkable. Two separate stereo chains that can be mixed and blended with an expression pedal, a floor based pedalboard with an extension on a stand so he can manipulate effects by hand, 4 isolated phase reversible outputs. It's a beast of a rig, and a load of fun to put together. I'm filming the process so this is going to be one for the books. What’s on your personal pedalboard at the moment? It changes frequently, but my constants are an AnalogMan King of Tone, Plosives Electronics May Booster, Thorpy Effects GunShot, DinoSaural modded OverLord, DinoSaural Opticomp, Electric Mistress, Strymon TimeLine and BigSky, Mooer Trem and PigDog Pedal FuzzBound. Is there anything you’ve ever parted with that you’ve regretted? Oh man, the list is endless. I had a first year of issue Phase 90 that I hadn't used for a while that I thought I'd move on, and I needed some cash. I put on consignment at a local music store. I walked out but 30 minutes later I had a moment of clarity where I thought, 'what on earth was I thinking'. I ran back to the store, but in that 30 minutes it had sold. I found another a couple of years later for around double the price I paid for it, but had to have it. Bought a Klon for £200, sold it for the same. Who knew! Clearly you’ve had a great deal of experience with guitar rigs, can you identify anything that really changed the game for you? The Electro Harmonix Electric Mistress was my first game changer. The old 18v dc one with the green writing. That was the first pedal I plugged into and instantly heard guitar parts, it was inspiring, lush, and I'd not experienced anything like that before. Then it was the old CE1 chorus, still an unbeaten sound.